Is your library preparing to observe Choose Privacy Week 2018? 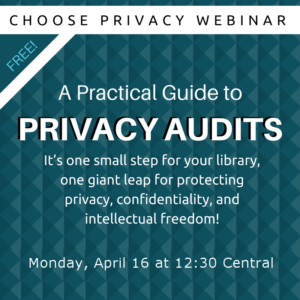 Join Erin Berman and Julie Oborny of the San José Public Library for a free webinar that outlines the first steps libraries can take to implement up-to-date privacy policies and procedures. 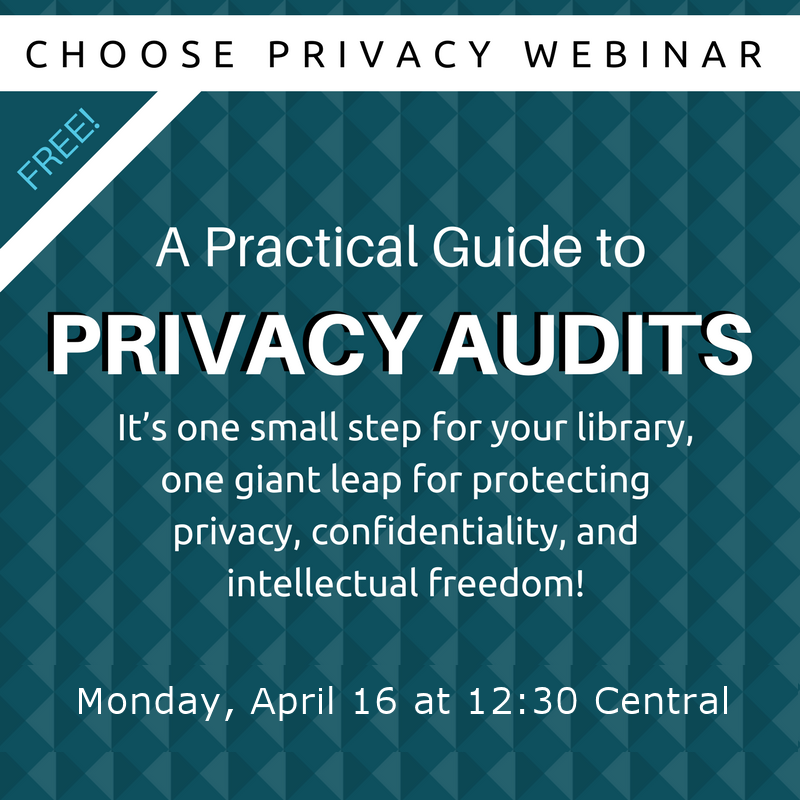 The webinar “A Practical Guide to Privacy Audits” will include a discussion about why healthy privacy practices are more critical for libraries than ever before and offers a step-by-step guide for starting a privacy audit at your library. The webinar will take place on Monday, April 16, 2018 at 1:30 p.m. Eastern/12:30 p.m. Central/11:30 a.m. Mountain/10:30 a.m. Pacific. Online registration is available via this link: www.ala.org/advocacy/intfreedomwebinar/cpw18. Space for the live webinar is limited and is granted on a first-come, first-served basis. Choose Privacy Week (May 1-8) is the American Library Association’s annual, week-long event that promotes the importance of individual privacy rights and celebrates libraries and librarians’ unique role in protecting privacy in the library and in society as a whole. For more information on Choose Privacy Week, visit chooseprivacyeveryday.org. Julie Oborny is a web librarian for San José Public Library (SJPL), where she focuses on analyzing, designing, and developing the library’s online experiences. As an advocate for privacy, intellectual freedom, and technology literacy, she valued the opportunity to work on the design and development team for the award-winning Virtual Privacy Lab — a free resource that helps people optimize their online privacy. Julie authored a chapter about social network sites, surveillance, and RFID in Protecting Patron Privacy: A LITA Guide. She also participated in SJPL’s privacy audit. Erin Berman is the Innovations Manager for the San José Public Library. She was an American Library Association’s Emerging Leader in the class of 2014, was named one of Library Journal’s Movers and Shakers in 2016 and is currently a California Library Association at-large board member. Her work in the library field has mainly focused on technology literacy, leading projects such as the Virtual Privacy Lab, the Maker[Space]Ship, and most recently, an internal privacy audit. The ALA Intellectual Freedom Committee’s Privacy Subcommittee monitors ongoing privacy developments in libraries, including technology, politics, legislation, and social trends. It proposes actions to ALA’s Intellectual Freedom Committee that promote best policies and practices for library users’ privacy and generally defend and protect the privacy of library users, librarians, and the public. The ALA Office for Intellectual Freedom is charged with implementing ALA policies concerning the concept of intellectual freedom as embodied in the Library Bill of Rights and with educating librarians and the public about the nature and importance of intellectual freedom in libraries. OIF supports the work of the Intellectual Freedom Committee and its Privacy Subcommittee. For more information, visit ala.org/oif.